The kids, it turns out, are not alright. In our cover article, Born Amid Bullets, Javier Auyero takes us to a barrio outside of Buenos Aires, where violence is an everyday reality for children, who witness shoot-outs, murders, and sexual assaults. “Every night, they shoot at each other,” one child reports. “It’s hard to sleep.” Auyero shows that children are not acclimated to daily violence—they are profoundly affected by it. Many well-intentioned Westerners are involved in efforts to relieve the suffering of children around the globe. In Central Africa, as a deadly war ravages the population, a group calling itself “Invisible Children” has mobilized young Americans to raise millions of dollars to address the plight of those caught in the crossfire. Amy Finnegan’s article, The White Girl’s Burden, looks up close at the organization’s “non-wave-making activism,” examining its appeal to a largely white, affluent, female and Christian base. What she finds is less than encouraging: a philanthropic enterprise that feeds state-centered interventions and circumvents indigenous efforts, often with harmful consequences. Young men’s masculinity is the focus as we move closer to home, to teenage boys’ lives in affluent societies, the subject of this issue’s Viewpoints. Mark McCormack, Freeden Oeur, C.J. Pascoe, Amy Schalet, and Niobe Way show us the limits of “boys will be boys” ways of thinking, and how the cultural scripts governing the lives of boys and young men are changing. 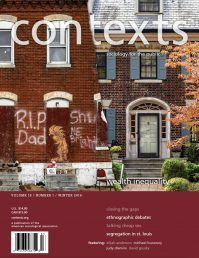 We’re also pleased to present a sneak peak at Patricia Hill Collins’s forthcoming book on intellectual activism, an analysis by Bin Xu of public mourning practices from Steve Jobs to Kim Jong Il, and Greg McLauchlan’s interview with a founding father of the Occupy movement, Kalle Lasn, among other articles. This issue also marks the end of our first year as editors, and it’s been a wild ride. Typically, we’re working on three issues simultaneously: as one goes to press, we’re putting the finishing touches on the content of the next one, and planning yet a third. Proposals and articles need to move through the review process at a rapid clip, and each issue must have the right mix of topics and authors. And then there’s images, copyediting, promotion, and all the rest — not to mention unexpected visitors like hurricanes. We’re indebted to the dedication of our editorial team, especially our fabulous managing editors, Carly Chillmon and Jennifer Hemler, for making the process enjoyable, and for helping us sleep at night. We’d love you to tell us how you think we’re doing, and suggest ways we can make Contexts even better. And we invite you to get involved by sending us your work, and encouraging your colleagues and students to do so, too. And while you’re at it, please like us on Facebook!